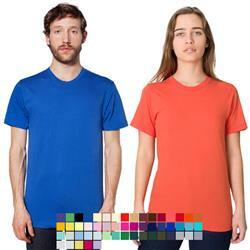 American Apparel Jersey Short Sleeve T-Shirt. This is one of the softest, smoothest, best-looking T-shirts available anywhere. Made in Downtown LA! The Jersey Short Sleeve T-Shirt is made of 100% fine ring-spun combed cotton, this lightweight fine jersey is exceptionally smooth and tight-knit, making it a standout choice for custom printing. Available in just about any color imaginable, finding the perfect shirt for you wont be hard. Unisex Fine Jersey Short Sleeve T-Shirt - 100% Fine Jersey Cotton construction (Heather Grey contains 10% Polyester) - Fabric weight 4.3 oz/sq. yard = 146 g/sq. meter (30-singles) - Unisex sizing: women may prefer to order one size smaller - Durable rib neckband - Form-fitting - Superior screen printing results - Made in the USA: Our most popular American Apparel t-shirt to date offered in our widest range of sizes and colors! Pricing shown is for white t-shirt with one color imprint. Add $2 for XXL. Available Colors: Black, White, Butter, Summer Peach, Creme, Poppy, Camel, Truffle, Brown, Cranberry, Coral, Red, Orange, Gold, Sunshine, Lemon, Light Pink, Pink, Mauve, Lavender, Ash Grey Apricot, Fuchsia, Raspberry, Eggplant, Purple, Navy, Lapis, Royal Blue, Teal, Aqua, Turquoise, Light Aqua, Ash Grey Sea Foam, Baby Blue, Light Blue, Sea Foam, Lime, Mint, Grass, Kelly Green, Forest, Oilve, Lieutenant, Army, Asphalt, Heather Grey, New Silver, Slate, Ash Grey, Heather Grey White Stripe, and Ash White Stripe. Available Imprint Options: Price includes single color screen print on one side. Unisex Fine Jersey Short Sleeve T-Shirt - 100% Fine Jersey Cotton construction (Heather Grey contains 10% Polyester) - Fabric weight 4.3 oz/sq. yard = 146 g/sq. meter (30-singles) - Unisex sizing: women may prefer to order one size smaller - Durable rib neckband - Form-fitting - Superior screen printing results - Made in the USA.